This treasure was displayed on the shelf near the checkout at our local library a couple of weeks ago, and as we all love a good Pioneer Girl story, we picked it up on a whim on our way out the door. I’m so glad we did! 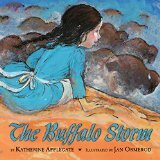 Written by Newberry Award-winner Katherine Applegate, The Buffalo Storm beautifully illustrates the story of young Hallie, who must leave her beloved grandmother behind and go west with her family to Oregon. It is written in free verse and is poetic and beautiful and full of adventure and heart. The Buffalo Storm is beautifully written with a message of strength and resilience and finding home. The lovely artwork suggests the vastness of the setting. We’ll read it again and again. We hope you will, too. I have some great friends. I got an email tonight from a wonderful friend who has been so supportive of me in the creation of this blog and the writing of this book. Occasionally she drops little things here and there that let me know that she is thinking of me and that when (if!) this book is done, she’ll read it. That’s at least one reader, right? A pioneer is not a woman who makes her own soap. She is one who takes up her burdens and walks toward the future. With vision and with courage she makes the desert bloom. So today I am thankful for friends who support me, pioneer women who walk toward the future, and all the little nudges that encourage us. 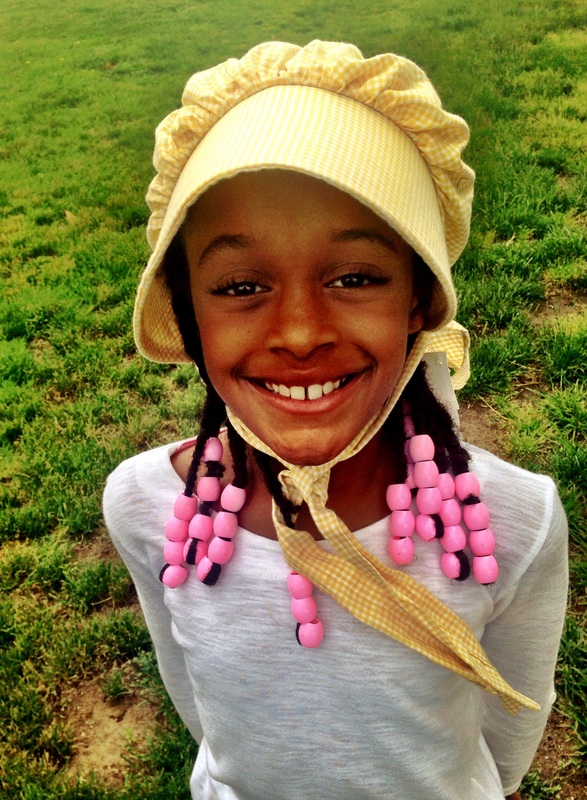 Pioneer Girl friends, we just had such an amazing #GrandmaDay. 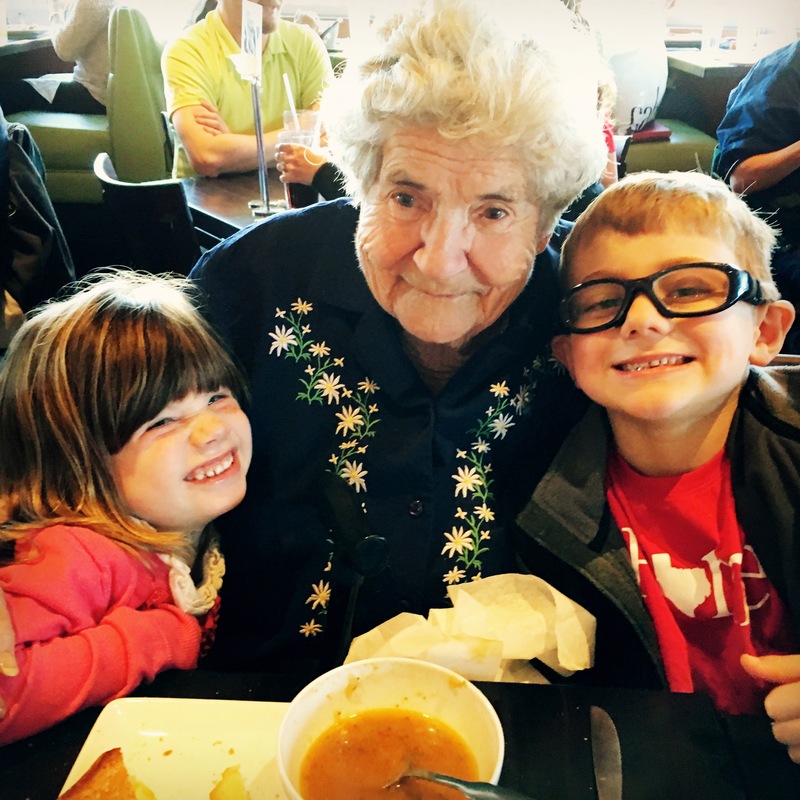 There was such a connection between my kids and their great-grandma, a cherished photo was snapped, and I think (and super hope) that a lasting memory was made. Every Wedneseday we have my beautiful 90-year-old Grandma over for lunch, also known as #GrandmaDay, my kids’ favorite day of the week. She comes over around 10 in the morning and stays until about 1pm, and while I cook she does puzzles and coloring with the kids, tells us stories about her parents and what life was like when she was young, and occasionally shares a signature recipe with us. Today we had all of that and more. These days Grandma is doing a little something I call un-nesting. We lost her husband, “Cowboy Grandpa,” four years ago this past summer, and she misses him dearly. She loves us and everything, but if he called her home today she would gladly go to him. In her preparations for returning home, she is slowly passing along her belongings to her descendants — and since she comes here every week, we are inheriting a lot of great things from her. This week she brought us her cookie press. Grandma has made Cookie Press Cookies since the 1950s, when her neighbor brought home this new fancy machine. Mr. and Mrs. Gardner were dear friends who lived in the house next door, and whenever Mr. Gardner found something new and interesting at the department store, he would pick up one for his wife and one for Grandma. Grandma says if she wanted it she could pay him for it, or if she wasn’t interested he would sell it to someone else or return it to the store. One day his find was a cookie press. Grandma and Grandpa had built their home in downtown Chandler, Arizona in 1950, and very shortly thereafter Grandpa’s mother, Elsie, who we call Grandmother, had to move from their dairy farm and into town for health reasons. Grandmother had been widowed young and when Cowboy Grandpa, her youngest son, married and moved “to town,” it wasn’t safe for her to be out there alone anymore. 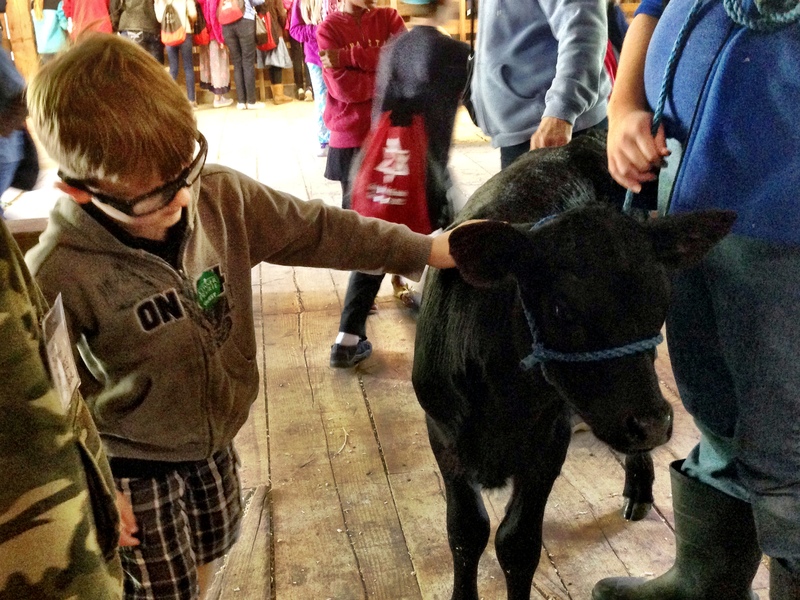 She sold the farm and built just down the street from her son and new daughter-in-law. 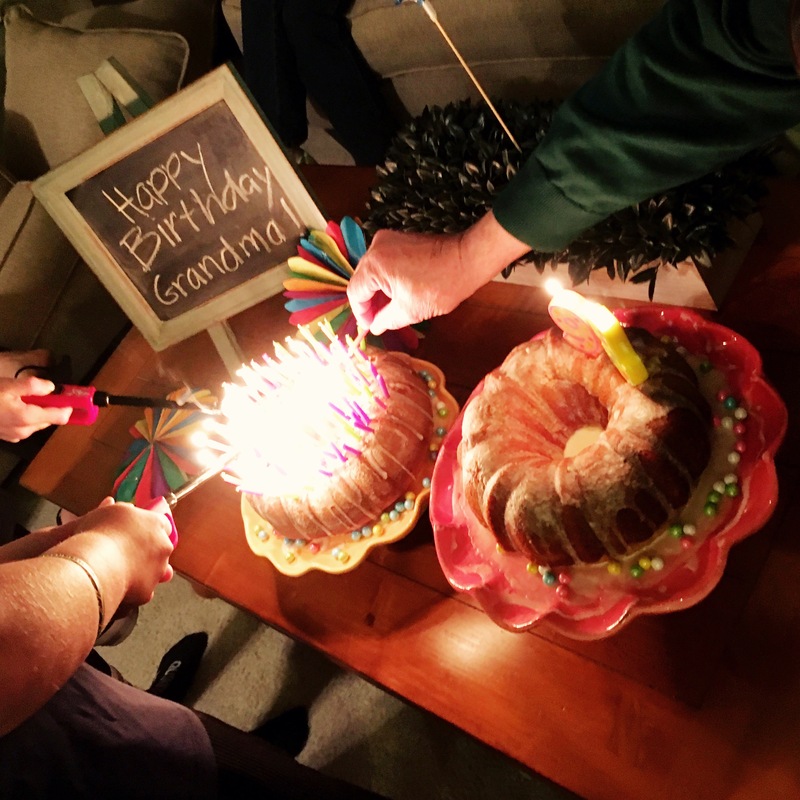 Grandma was a Mormon, had been born and raised in the Church, and while Grandmother wasn’t fond of the religion, she quickly became fond of the new daughter-in-law. Grandma’s second language is service, and she has always found many small ways to endear herself to everyone around her. Elsie was no exception, and the day Grandma took her first batch of cookie press cookies to share, Elsie was even more impressed. Elsie and her husband had been early and influential residents of the area, and she remained active in political and social circles in the community throughout her life, even after her husband’s passing. She frequently hosted parties for ladies’ activist groups and luncheons for the ladies from her Methodist Church congregation. Every time she was going to have a ladies’ group over, she would order up a few batches of cookie press cookies from her daughter-in-law. She found them the perfect light and elegant treat to serve the ladies. 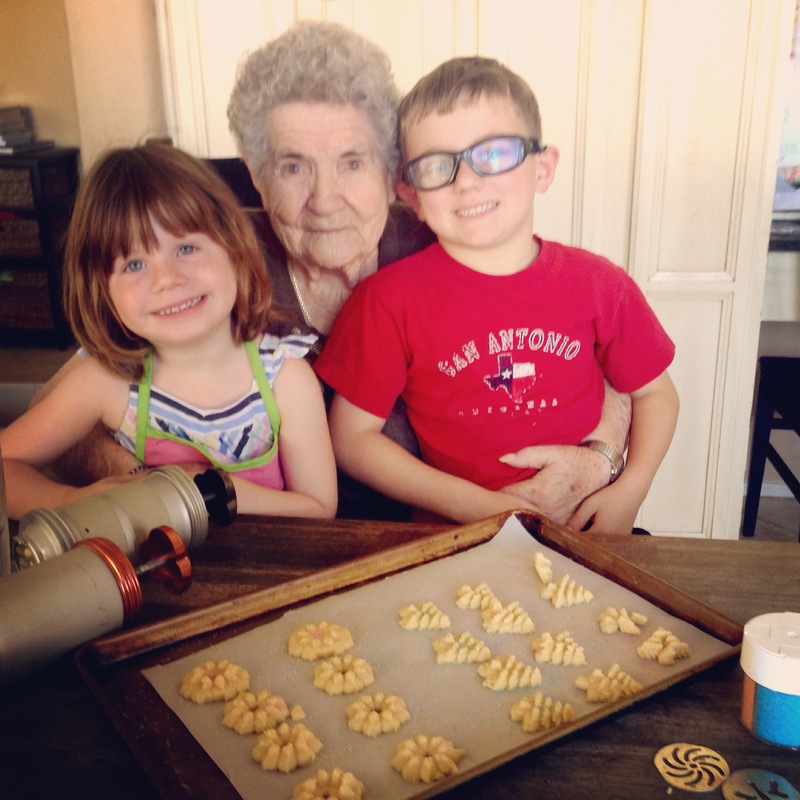 Grandma continued to make cookie press cookies as a Christmas treat for her friends and family until just a few years ago when cooking and baking became more of a struggle as she approached 90 years old. The cookie press has sat in the pantry for the last few years, until Grandma brought it to us this week. We cleaned it up again and tracked down a recipe and had a wonderful morning mixing up the dough, having Grandma show us how to work the press, and sampling the tasty results. And after these few hours of working and talking and laughing together, I feel closer to my great-Grandmother, and my Grandma, and my kids. I hope they’ll remember this morning spent with their great-Grandma. I think they will. How do you celebrate Labor Day? For so many of us, it’s a seasonal marker — the end of the long, hot days of summer, back to school for students and back to work for Congress. But is there something more to it? Labor Day was created as a day to commemorate the social and economic achievements of workers here in the U.S. For some workers, it’s a day off to remember how hard we work all the other days, a nice long weekend before we start our fall routines. to help us get the most out of this “day off” and honor those who work hard for us all year. Our family was excited to get out and mark of *most* of the activities over the course of the weekend. We decided to take cards and donuts to our local firehouse and thank the firefighters who keep us safe. Kids got out crayons and paper and made pictures and cards for the firefighters and paramedics. We remembered watching them come to the rescue recently when we saw the immediate aftermath of a car accident. Last week on the way home from school, we stopped at an intersection and saw a horrible car accident a few feet up the road on the cross street. We got there right after it happened, just before the first firetruck arrived. Two sedans and a pickup truck were involved, and one of the cars somehow ended up on top of the other. We prayed that everyone would be taken care of and that any children involved would be comforted. Today when we decided to go over and thank the firefighters and paramedics, the kids remembered what they had seen and how a kid involved in that accident might have felt. It was a great experience to be able to go thank them in person and let them know that we appreciate the work they do for our community. Next we decided to indulge and work on #2 on the list: “Support your community. Eat at a locally owned establishment!” We headed straight over to Joyride Taco House for tacos and quesadillas and burritos, and fun. We found ourselves with a few ideas and options for #5: “Find a statue of someone and tell us about that person.” Since we are a bunch of PioneerGirls, we considered going to Pioneer Park in next town over and taking a photograph of the pioneers there, the people who came to settle Lehi and Mesa, Arizona. 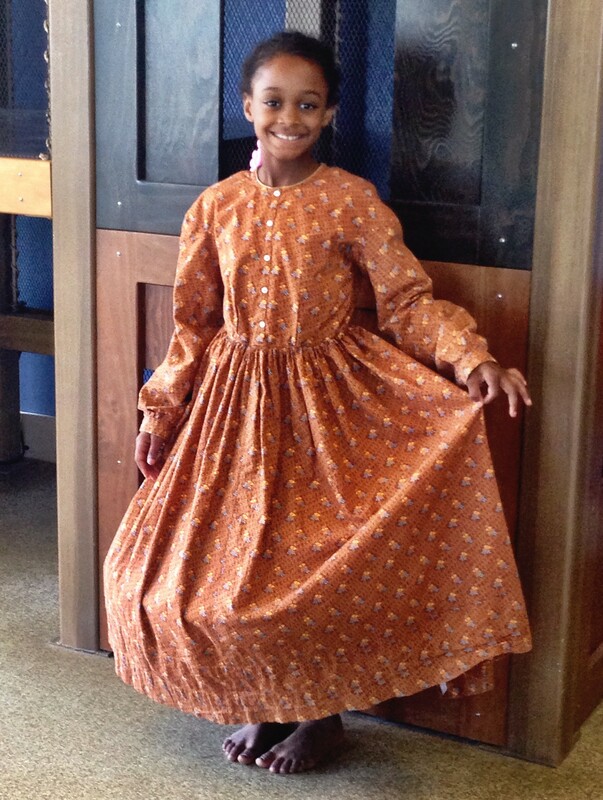 Our own Pioneer Girl Emma Higbee is one of those pioneers! But we decided to try to keep it local and stay in our town, so we headed to the new Gilbert Arizona Temple and chose the Angel Moroni who is on the top of the spire. Moroni is found on top of many ‪Mormon temples‬ around the world. He represents the Angel spoken of in the book of Revelation: “I saw another angel fly in the midst of heaven, having the everlasting gospel to preach unto them that dwell on the earth, and to every nation, and kindred, and tongue, and people” (Rev. 14:6). On our way home we grabbed a photo for #9 on the list: “Show us street art!” This mural is painted across the street from a school in our community. It was recently updated as an Eagle Scout project and we love seeing it when we pass by. We got home for the afternoon and took another dip in the pool. Labor Day might mark the unofficial end of summer other places in the country, but we’re still in the heart of 100-degree weather. We’ll swim through October! A few hours later as the sun began to set, we decided to head out to accomplish the last two items we’d be able to do this weekend. First, #10: “Be an explorer! Head out to a local hiking and biking trail and show us something unfamiliar to you.” We got the bikes out, dusted them, aired up the tires, and set out to explore. It was a little late in the day to find something new, but we did find something we love: an Arizona sunset. We rode through our neighborhood to a little lake and watched the ducks swim for a few minutes. Then we hopped back on the bikes and headed back to the Heritage District for #8: “Summer is almost over. Womp womp. Keep it alive by showing us your favorite summer treat!” We headed straight to Dairy Queen for a traditional family favorite, dipped cones! We had a great weekend remembering those in our community who help make it great, and enjoying a day off as a family. I think we’ll make this Labor Day Scavenger Hunt a Pioneer Family tradition! We are a flexible travel family. We go and we find and we do. If we learn about something we need to experience, we head out and experience it. Today we started with a plan… and our plan changed. 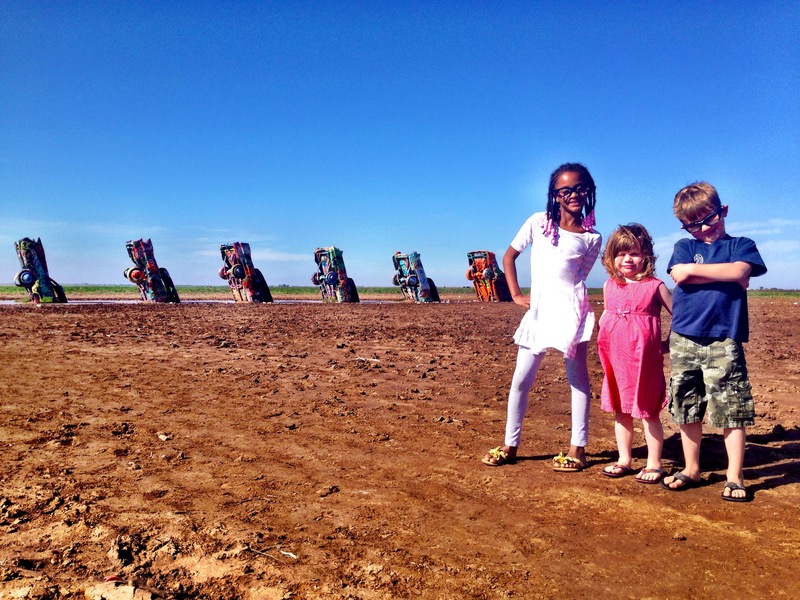 We woke up in Amarillo, about five minutes from the Cadillac Ranch art installation. Since we go and find and do, even though it was a little backtrack we went to see this Americana landmark. You can’t not, right? It was muddy and wet from the previous night’s thunderstorm, but that only made it more appealing to these flip-flop people. 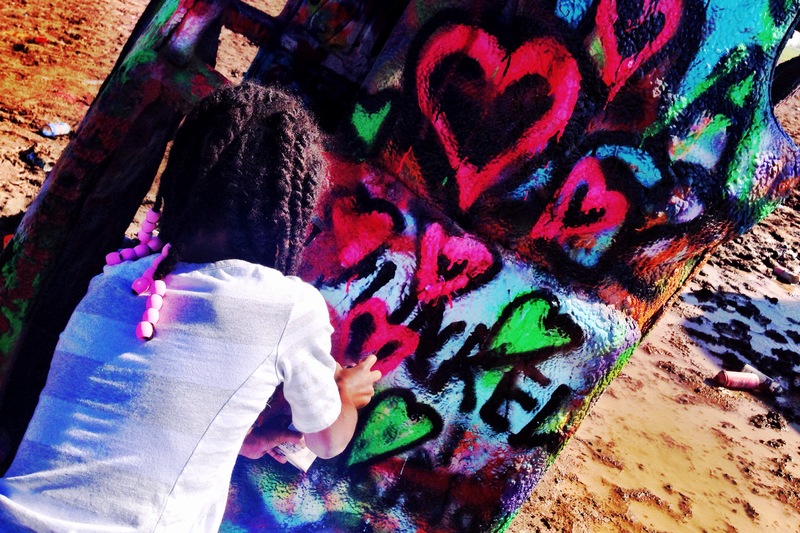 They scavenged for spray paint cans and added their own elements to the work. Next time you’re there, seek out the “E,” “J,” and “C” on the westernmost Caddy. After the Ranch we stopped in at the Cavendar’s to find Texas Boy a Texas Shirt, but we had no luck. That’s what the Internet is for, right? One of these will be waiting for Texas Boy when we get home. 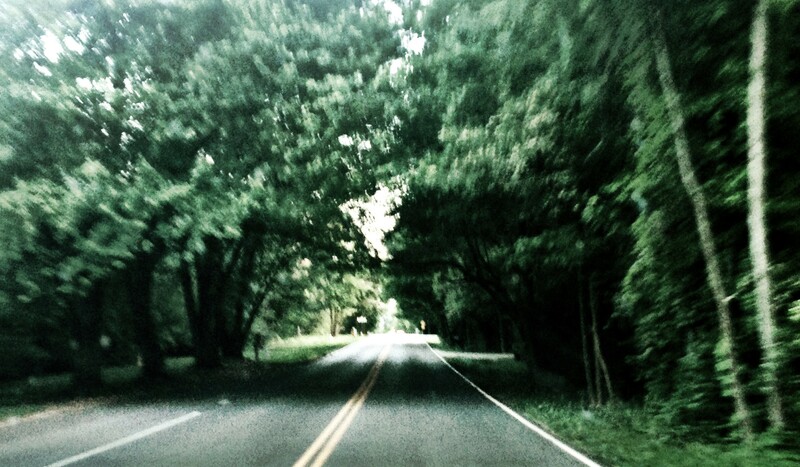 Then it was time to get on the road. These western states are huge, y’all, and if we’re going to make it through #thirteenstates we have to log some miles. We cruised through the Texas Panhandle and on into Oklahoma. 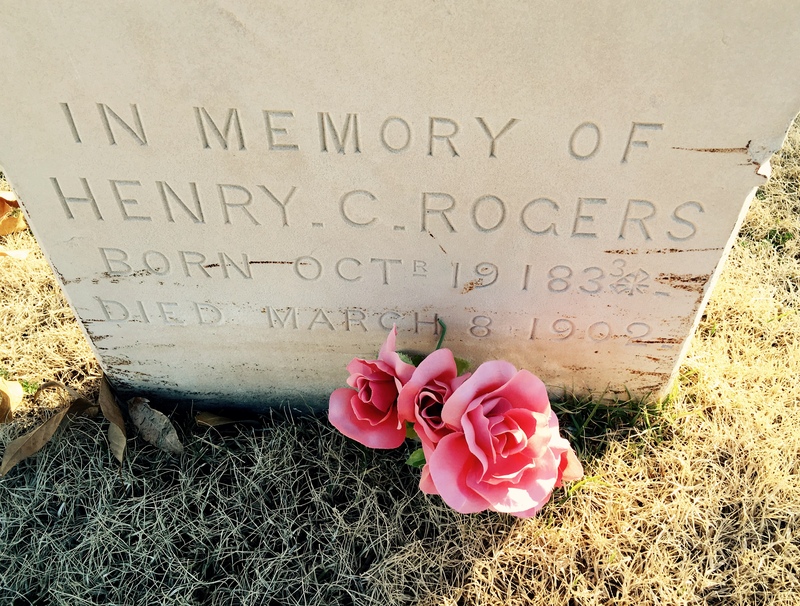 We had planned to head straight through to Okmulgee and Muscogee, towns that were of interest to me because of my family history, but when we checked the map and realized we’d be driving right through Oklahoma City, we added a stop. On April 19, 1995, the deadliest act of domestic terrorism was committed in downtown Oklahoma City. When a truck bomb detonated outside the Alfred P. Murrah Federal Building, 168 people were killed, 19 of whom were children under the age of six. In the place of that destruction now stands a beautiful memorial that we wanted to witness. If we were going to go visit this place and take our three little children, we knew we had to tell them that it was a memorial and tell them how to behave there. If we told them it was a memorial and a quiet, reverent place, we were going to have to tell them what happened there. We’re kind of shelter-y parents. We talk a lot more now with Miss Pickle about world events because she hears about them at school, but we don’t bring up a lot of sad or scary events with the kids. I prefer to allow them to have a quieter, less stressful childhood, so unless I know something is going to come up at school and I think she should hear it from me first, we pretty much let her stay a kid. But taking the kids into this place, we knew we needed to prepare them. About an hour before we arrived in OKC I turned around in the front seat to talk to my kids. I told them about the angry men who were upset with the government and decided to use violence to make a statement. I told them about the innocent people who were injured and killed there, including children. I told them how the place where it happened became a memorial, and that they needed to be respectful of the sad thing that happened there that day. And then I told them about Survivor Tree. Survivor Tree is a hundred-year-old American elm that stood in a parking lot across the street from the Murrah building. People would come in to work early to find a parking spot in the tree’s shade, a little bit of respite from the sun. 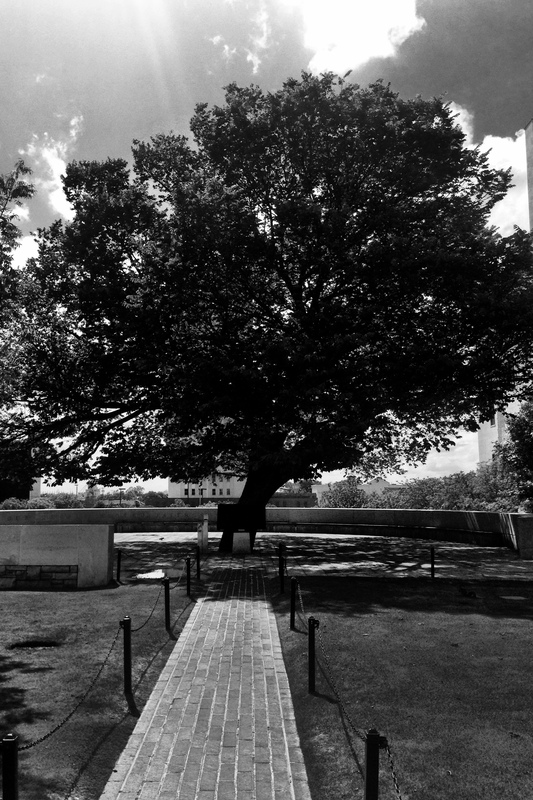 The day of the attack, Survivor Tree was nearly destroyed. Evidence from the blast was embedded in its trunk, its limbs were blown off by the force of the explosion, and fire from the cars parked near it that day charred it so badly that people didn’t think it would live. But, I told my kids, a year later when victims and friends and loved ones gathered for a memorial service there, they noticed blossoms forming. Survivor Tree survived, and now it stands as a symbol of the resilience of the people of Oklahoma and of the United States. It stands as a symbol to us that if our roots are deep and strong, we can survive hard things and come back even more beautiful than before. We asked if they wanted to go see this place and if they would have appropriate behavior there, and they all said they did and they would, so we headed for downtown Oklahoma City. A few minutes after I finished telling them the story and turned back to help our driver navigate, a voice called out from the backseat. It was my five-year-old son. We had lunch at the delightful Kitchen No. 324, where we were seated outside near a small grassy area where the wiggly among us could wiggle. It was perfect since we knew we were going to let them walk around the memorial but not run and jump and somersault and cartwheel, which they really needed to do. We enjoyed the “Oklahoma fluffies” and let the wind come roaring down the plains and through our hair. After lunch we went to the memorial. As we approached it from the east, the kids were drawn to an outdoor chapel on the ground of First Church. That boy who was touched by the story of Survivor Tree asked if we could kneel in the sanctuary and pray. He offered the sweetest, simplest prayer for the people affected on that day and for the tree that brought hope. It was the perfect way to start our visit to the memorial — where somehow they all managed to behave. After OKC, it was time to get on the road again. We went to Okmulgee, Oklahoma, which is the government seat of the Muscogee (Creek) Nation, where I am a tribal member. My great-great-grandmother was named on the 1906 Dawes Indian Census, along with two sisters and a brother. 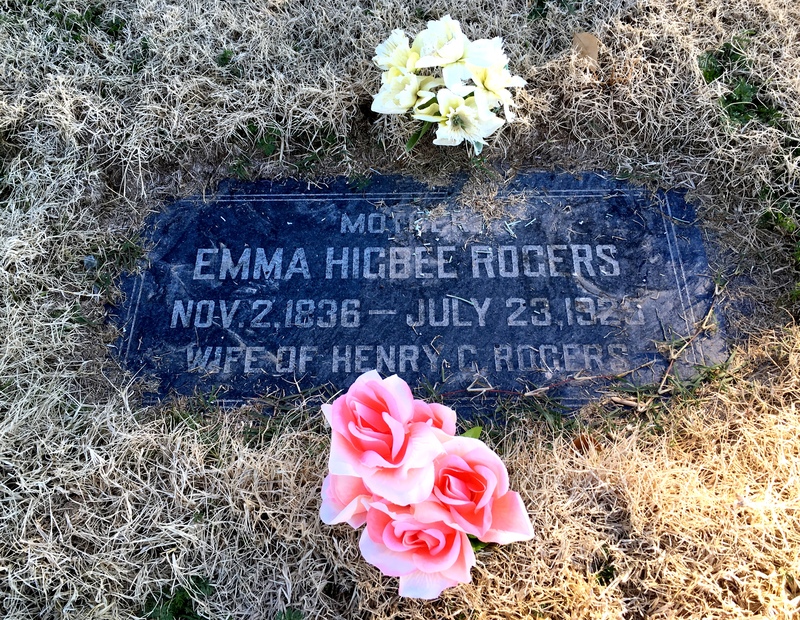 Her family a few generations back had come to Oklahoma on the Trail of Tears, and her descendants remained there until as a young boy my Gramps left Oklahoma with his family during the Dust Bowl, headed for California. California was a little too far to travel, it seems. The family ended up settling in Arizona, and now here we are. In Okmulgee we went to the Creek Council House, which was erected in 1878 shortly after their arrival in Oklahoma Territory. It was very moving to be in the place where my family had been for many years, which I had never seen. 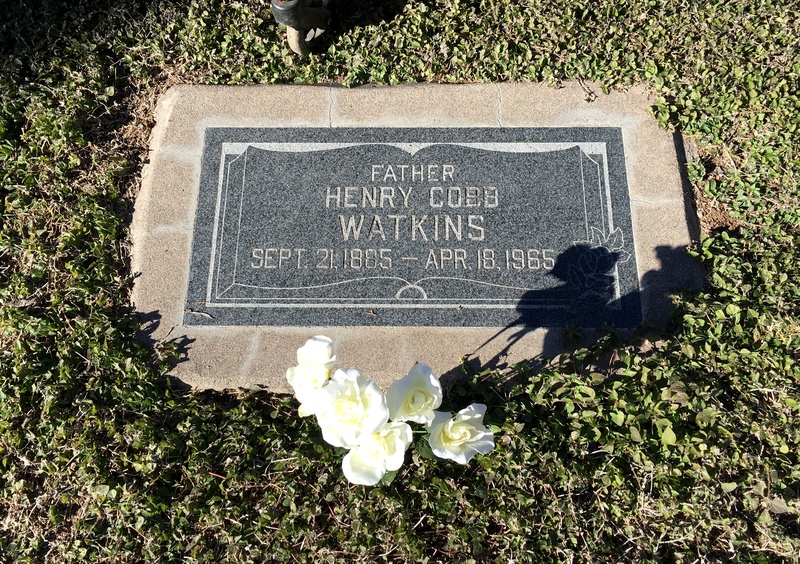 Gramps died when I was young and any memories of his life in Oklahoma are lost to me for now, but researching that part of my family history has been very meaningful to me. 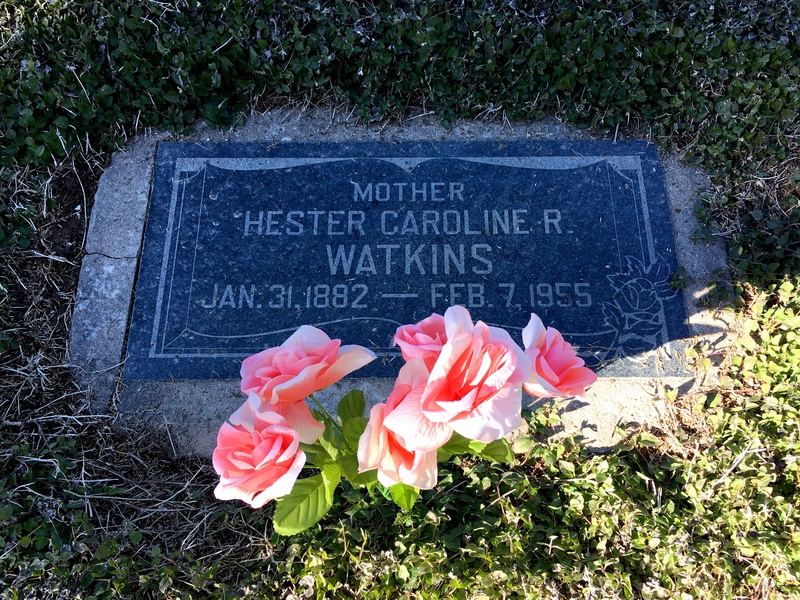 I feel a connection to that great-great-grandmother, and I’m so glad I got to walk in the place where she lived. We had intended to continue on to Muscogee, Oklahoma, where the Five Civilized Tribes Museum honors those who were relocated to Indian Territory during the Trail of Tears — the Cherokee, Creek, Choctaw, Chickasaw, and Seminole. Our stops in OKC and Muscogee put us behind schedule, though, and we would have arrived in Muscogee after the museum had closed, so we decided to turn north and head into Kansas. We crossed the state line into Kansas at Coffeyville, where I missed my “Welcome to Kansas” picture and made the driver turn around to give me a second try. Whew! We marveled at the W.P.Brown Mansion as we cruised through, an enormous home built in 1906 by a local natural gas magnate. Late night Kansas backroads took us up to Overland Park (“Fancy Kansas,” according to my favorite Kansan), where we rolled in well past everyone’s bedtimes and promptly got to bed. Two years ago we made our first cross-country trip in a minivan with three kids (then 7, 3, and almost-2), traveling from Phoenix to St. Petersburg, Florida. Other than the dearth of excitement in West Texas, it was a great trip. We listened to our bodies and to the kids to know when we needed a break, and made good use of refueling and lunch stops. We ate from our “food box,” so at least one meal per day was a picnic at a local or national park. (We take our National Parks seriously.) As we traveled, if the kids needed to stop and wiggle, we stopped. 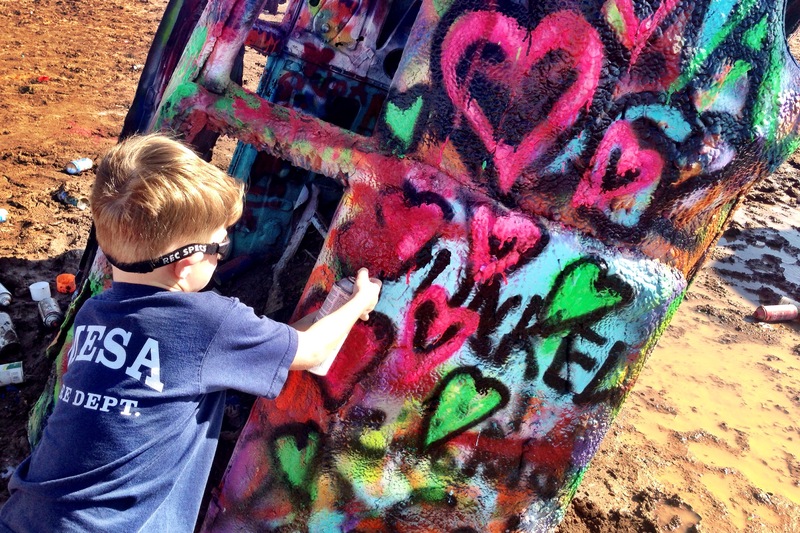 If we saw an interesting roadside attraction, we visited it. 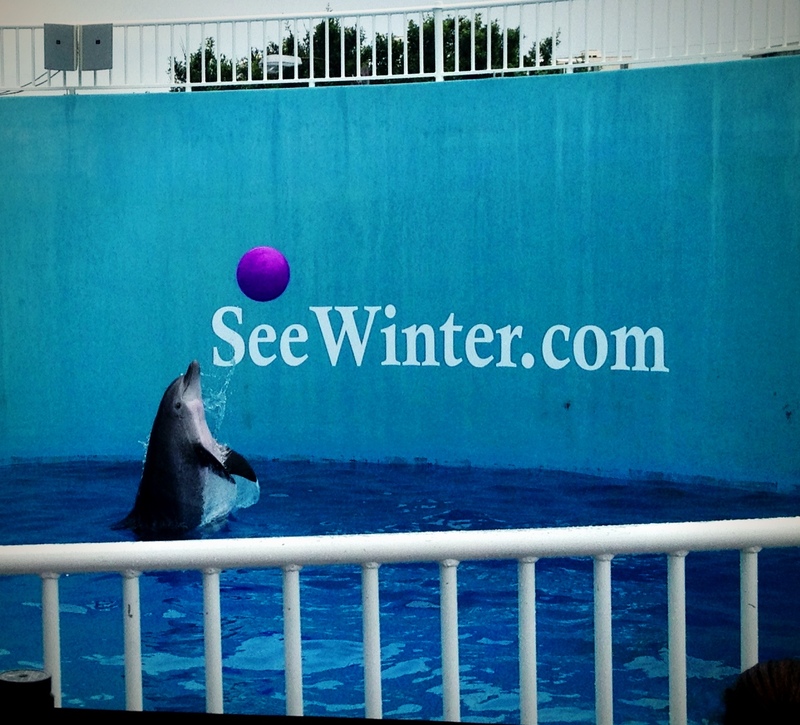 We played with cousins in Houston, ate beignets in New Orleans, swam in the Gulf of Mexico on a stunningly beautiful beach in Destin, and visited Winter the dolphin in Clearwater. We kept a map of our route and traced each day’s progress with the kids. Our destination was St.Pete, but we had little plans to do other things along the way so each day had something to look forward to. In high school I made a goal of visiting all 50 states. It’s not an easy concept out here in the West. I can drive for four or five hours and not make it out of Arizona. (Don’t even get me started on Texas.) When I moved to the Washington, D.C. area after college the goal suddenly seemed feasible. I could go north from Arlington, Virginia, where I lived, and knock out four states, not including Virginia or the District, in that amount of time. My husband’s family is from Florida, so we took the I-95 trip south from D.C. several times in the 9 years we lived there, including delightful stays in Charleston, Savannah, and North Carolina’s Outer Banks. So as I’ve continued to check visits to different states off my list, I’ve started recording our travel for my kids, too, hoping that they’ll have the same goal eventually. Before we set off for trips to Colorado and Florida in 2013, I created a “passport” for each of my kids. Each page has the name of a state at the top. (They’re in alphabetical order for ease in finding them when traveling.) I put each kid’s photo inside the front cover and had them each sign their name. (Super legible when you’re not yet 2.) Whenever we stopped and got out of the car, we grabbed the bag of passports and carried it with us. When we had a moment — waiting for our food at a restuarant, playing in a park, whatever — we got the passports out and wrote down the city we were in and the date, and then the kids stamped that page of their book. Another awesome benefit to this that I didn’t even anticipate is that the National Parks Service (serious nerds over here, folks) has put out their own National Parks Passport, so as we visit those, they have their own stamp we can log in our passports. Of course we also bought one of their passports, so there’s just hours of stamping fun whenever we get out of the car. This year I found these great printable stickers we can use. Super nice because they’re the perfect size to use with a 1″ hole punch. Each kid will get a set that we’ll keep with their passports, for this trip and future trips. The kids love all the stamping and stickering, of course, but I hope that they will be glad to have this record of the places they’ve been and the things they’ve seen. We have our family photo albums, but this is a fun way for the kids to record their travel and when they visited each place. 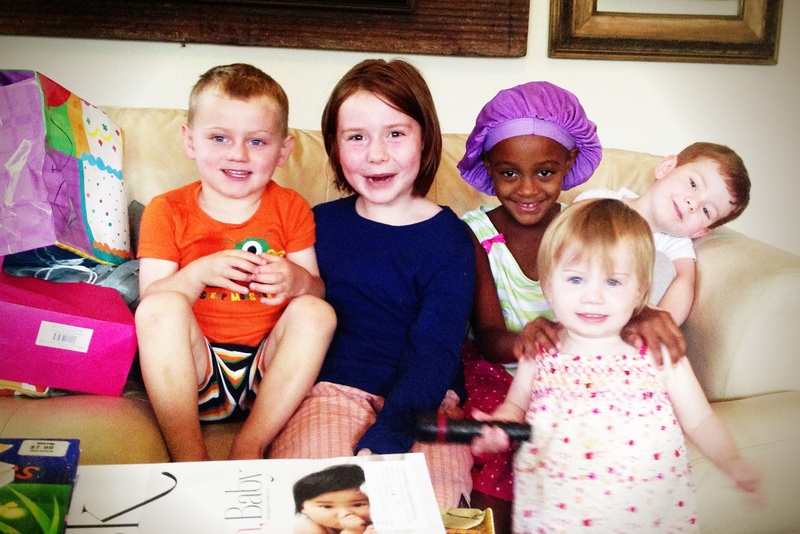 And hopefully someday they’ll each have an international passport, too, and I’ll get to watch as they explore the world and fill their books with even more stamps.